As some of you dear “Wine-osaurs” may know, I’m not terribly interested in the elitism of vino, or in the snobbishness that lurks in the darkest depths of the wine world’s psyche. I’m here to relieve you of all that stuffiness, to dust down the cobwebs of confusion and to make the world of wine a fun and exhilarating place. If you really want to see a grown man rip off his bow tie in despair, just quote to me from wine critics. Never, ever tell me how much a wine critic’s convoluted rating system influenced your wine buying decisions. Not only will I immerse you into a vat of pickled tomatoes up to your ear lobes, I’ll also sing the opening number to the “Sound of Music” – and I ain’t no Julie Andrews old bean! 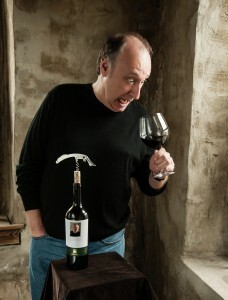 As far as I’m concerned, wine critics have no redeeming qualities unless you consider the ruination of a winemaker’s entire livelihood an endearing characteristic. Don’t let anyone dictate your drinking habits or spend your money for you – that’s the exclusive privilege of spouses! Which leads me to another interesting Silverstone observation. Wine-upmanship seems to hit men during their middle years, you know, when they trade in the sensible five door car for a two seater convertible in go-faster colors. And let’s not forget the price tag syndrome. If it costs a lot, and was produced in France, it’s replacing the Rodin in the living room. That’s absolute gobbledygook. Wine isn’t made to display it’s made to drink. And the quality of a wine isn’t determined by it’s price tag, never has been and never will be. I make it a habit never to spend more than $15 on a bottle of wine (retail). Now, I didn’t say I wouldn’t drink anything more expensive, because I will, but only if someone else is buying! You can find some really excellent nectar from Bacchus well within this price range and there isn’t a cork sniffer around who could prove to me their $150 bottles are any superior to these more affordable varieties. So “which is the best bottle of wine to pour?” That’s easy…the one you most enjoy drinking. Regardless of its price or its place in society, if you love it, that’s the one for you. Don’t be intimidated by wine and always buy what your bank balance can support …not your ego – Cheers!